But unfortunately, Dad couldn't make it. He'd have got on well with Margaret. The Margaret Fulton musical is nearly here. 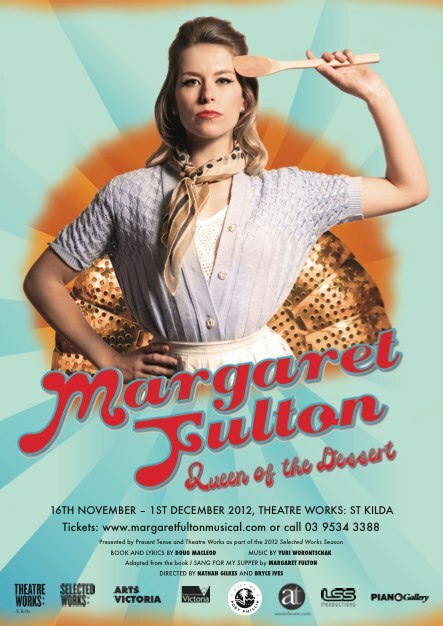 With a bit of luck, my stroky Dad may be well enough to attend the forthcoming production of Margaret Fulton, Queen of the Dessert, the musical that I wrote with composer and mate Yuri Worontschak. The cast members are young and ludicrously talented. 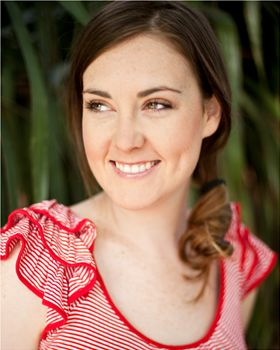 Our beautiful leading lady, Amy Lehpamer, can play the violin as well as sing and dance, so we've written a violin solo into a scene set in The Rocks in Sydney, where the tenants (Margaret's friends and neighbours) sing a song about their love of La Vie Boheme. I started writing this so long ago, it's hard to believe it's about to happen. Although we've just has one major setback: poor Amy, our aforementioned leading lady, has caught chicken pox, so she can't rehearse for a week. Amy Lehpamer not with chicken pox. I haven't made a big deal about my stroke recovery in any of the media interviews I've done, but the fact that you're reading this blog suggests that you might already know about it. For the moment, I think that one of the best things you can do to aid stroke recovery is keep busy, find a group of energetic people to be busy with, and put on as musical. I realise this remedy may not be readily available for all stroke survivors. I'm particularly fortunate in that regard. It all started when I volunteered to work on the musical Call Girl last year. Call Girl is a musical written by my friend Tracy Harvey. It's about love and laughter in a call centre. Tracy actually worked in one of these places for a short while. YOu have to harden up. Most people you 'cold-call' really don't want to talk with you, and you might have dragged them away from something important, such as Letters and Numbers or dinner. It was interesting for me to go from an experience of dreading the call centre calls, to a position where I couldn't wait for them to ring me, so that I could plug our show. I think I must be the only person who ever managed to 'sell' anything to a call centre caller. Tracy kept a notebook full of the adventures of working in the call centre, and came up with a clever script where it was possible to sympathise and even cheer for the 'phonies', after all, they were human beings like you or me, who had, in many cases fallen on hard times. One of the best experiences of working on Call Girl was getting the chance to work with director Bryce Ives. Bryce is 28 and one of the most dedicated people I have ever met, somehow making himself available to deal with the concerns of cast and crew (and there were plenty) while somehow keeping the whole vision of the show together. Our cast (with the exception of Tracy) were all fairly new to the business, but Bryce brought out the best in them all and the end production was slick and funny. I hope we get a chance to do it again. After seeing how well Bryce brought together the various components of Call Girl I decided to show him the remnants of a script and some songs I had written for the Margaret Fulton musical. There have been a lot of bio-musicals lately, as well as some that take inappropriate subject matter and turn it into a musical, so the biggest joke is that someone has gone to the effort of producing a whole musical about the life of Shane Warne, or a dystopian world called Urinetown, where water is scarce and lavatories may only be used if a substantial fee is paid to the corrupt company (Urine Good Company) that runs the town. The trouble is, unlikely subject matter that is often the only joke, and what might have worked well as a two minute joke on The Simpsons (they've already done parody-musicals based on The Planet of The Apes and also A Streetcar Named Desire, to name but two) flounders when it reaches the midway point. I haven't seen Warne, so I don't know if this criticism applies, but I did see Urinetown, and also the musical about Jerry Springer, and it was hard for me to last the distance. I'd met Margaret Fulton - the 'celebrity chef' - while doing some research on a TV program proposal for Steve Vizard's production company. Margaret and I spent a morning together. Margaret was, and is, phenomenally entertaining. Conversations with Margaret often collapsed into giggles as Margaret would suddenly go off on a tangent, recalling an anecdote that might involve Germaine Greer or Jorn Utzon or any other artistic, political and literary celebrities of the fifties and sixties. Margaret, you see, had a knack of being in the right place to commune with the great and near-great. It helped, of course, that she was strong-willed, intelligent and courageous. 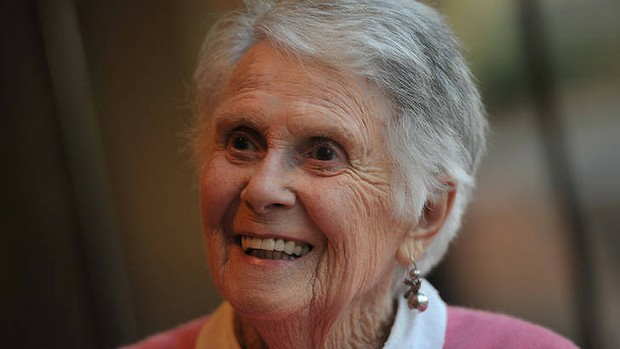 Margaret was the first female business executive in Australia, with her own line of credit. 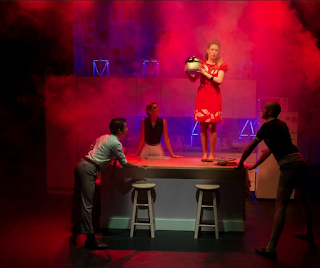 The musical recreates some funny but true moments where male executives have underestimated Margaret, or even mistaken her for a 'lady of the night', which once happened during a business trip to Canberra. After I met Margaret I was determined (though not driven) to create a musical about her life, since the performing arts had been such a major part of it. 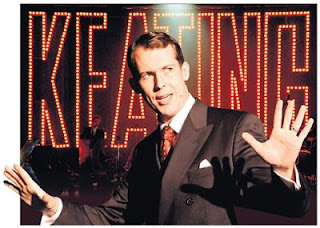 This was, I think, before Casey Benetto did such a good job with his musical about the life of former Australian prime minister, Paul Keating. I think one of the reasons Keating worked so well is that Casey put a lot of heart and soul into the script. It wasn't just funny (fantasically so) it was also moving and a fair representation of a full political life. I wanted to make the Margaret Fulton musical a genuine biographical piece with music of the various periods of history that Margaret's life spanned. A typical Margaret Fulton pic from the early sixties. You can tell she's a communist, can't you? When Adam Cook, the artistic director of The State Theatre in Adelaide asked me if I had any show ideas (we had just finished working together on the Midnite musical), I mentioned the Fulton project and he burst out laughing. He thought I was proposing yet another of those inappropriate subject matter joke-musicals. To give people an idea of what I really wanted to do (and Margaret was yet to give us her blessing - she has now) I thought the best thing would be to put together a collection of songs to demonstrate the sweep of the project. I bought the rights to Margaret's autobiography, and the first song I wrote was a huge thing called The Book. It's a song about Margaret's first cookery book, which broke all records by having an initial print run of one million. That's the story, anyway. I don't quite know how it is possible to do such a massive first print run unless you are, say, doing the latest volume in the Harry Potter series. But Margaret insists that Paul Hamlyn, the famous semi-teutonic publisher and patron of the arts commissioned an initial print run of a million - when there were only about eighteen million people in Australia. 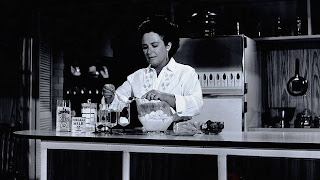 (This gives you an idea of how popular Margaret Fulton was in the fifties and sixties, when she was contributing to Woman's Day and New Idea, as well as appearing on the exciting new medium of television. I suppose if anyone could do a primary print run of one million, then Paul Hamlyn, with all his Asian printing connections, could. There's a song about him in he show, and we've delighted in presenting him as the King of Colour, a sort of pop-art swinging guru that would be quite at home in The Beatles' movie, Yellow Submarine. And we've placed him right at the heart of swinging London, where Margaret did dozens of highly successful book signings (although people weren't queueing around the block as they did at the Australian signings). So the first song I put down with Yuri was a massive rock opera piece about this massive book that introduced bland Australian cooks to such novelties as garlic and Indian spices. Australia really was somewhat insular in her cookery tastes. Never mind that we were in the middle of the pacific, but we based our menu on English rather than Asian tastes. 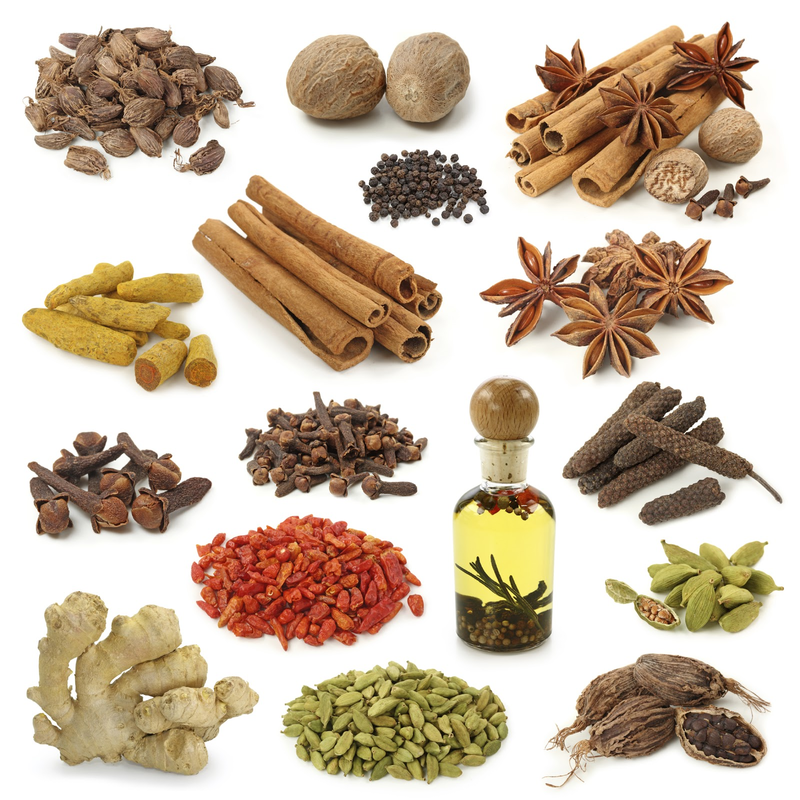 Exotic herbs like cumin or cardamom were barely heard of. But Margaret Fulton's cookery book introduced Austrtalian men and women (okay, mainly the women) to a myriad of new flavours and exotic methods of food preparation. 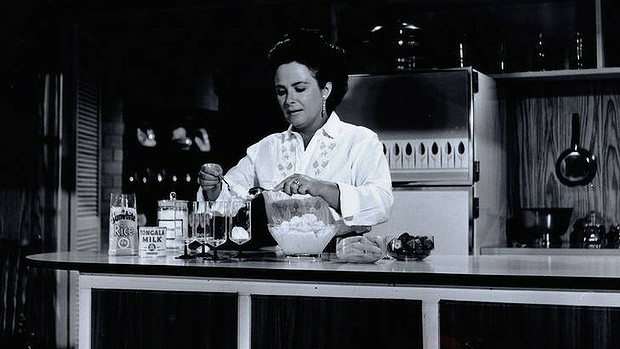 Readers of The Women's Weekly lapped it up, and Margaret's book became the cornerstone of modern Australian cuisine. All the while, Margaret was presenting a fairly conservative image to the readers of the women's magazines. Most photographs of her featured her presiding in a matronly way over wonderful spreads of food; exotic, spicy food that the readers could make for themselves. But Margaret's seemingly conservative image was at odds with her true self. Fiercely independent, she set out to create a career for herself in Big Bad Sydney (she was born in Scotland but spent her childhood in Glen Innes, in rural New South Wales). Margaret had a young daughter from her first marriage, which broke up fairly swiftly when both parties realised they didn't share a lot in common. Thus, Margaret became a 'rebellious' single mum (there weren't so many of them back then) who decided that the best, most convenient place to live would be in the famous, sometimes derided 'Rocks' district of Sydney, right near the south end of the bridge. The Rocks. It used to be rough, now it's a repolished gem, a bit like my beloved St Kilda. Margaret's friends were her fellow tenants; a lively mixture of actors, artists, writers and musicians. The show features a big song called La Vie Boheme, or The Bohemian Life, which was very much the life that Margaret lived when she wasn't working in the ACP building on one of the magazines. Margaret's daughter Suzanne is on record as saying that she thinks her mother had poor taste in men. 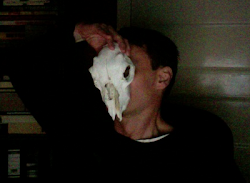 They were always good-looking and 'interesting', but they were sometimes dishonest, even predatory. I wrote a song called Decorative, Elegant and Useless, which strives to encapsulate Suzanne's opinion of her mother's ability to hook up with disastrous men. I wrote two more songs, one piece to encapsulate Margaret's energetic philosophy of life. It's called I Sang for My Supper. 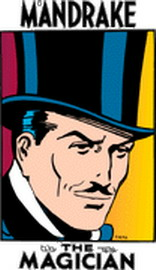 My favourite song in the show is about a 'Bohemian' character called Mandrake the Magician, a female legal eagle who attended one of Margaret's many custume parties, dressed as the male cartoon superhero Mandrake, and promptly had an affair with Margaret's husband at the time, Denis Doonan. With the bare bones of a script and a CD of six songs I pitched the idea to Margaret. I wasn't quite sure how she would take it, but it was a good pitch. 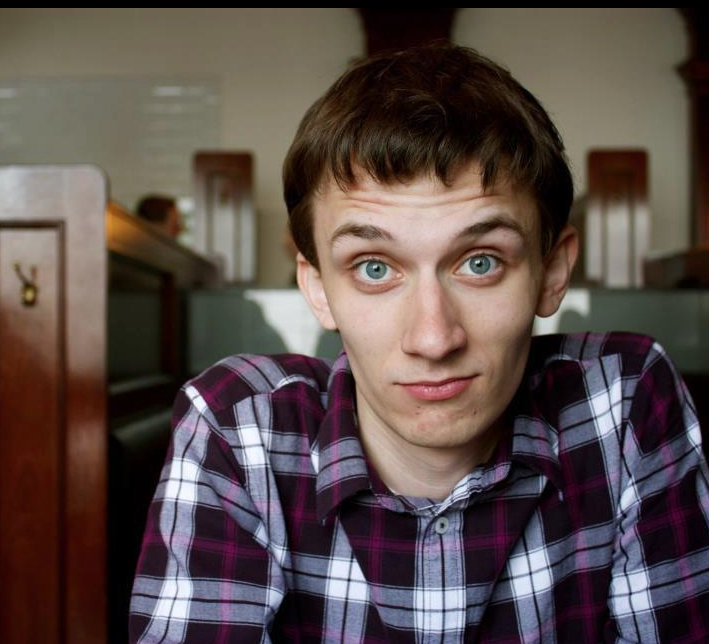 Yuri Worontscak produced the songs so that they were technically of a high standard, and we had good singers such as Mark Trevorrow and Shaun Micallef performing the lyrics. I sat and listened to these songs with Margaret, having to translate a few lines because Yuri, like many musical producers, thought the music was more important than the lyrics and the balance was wrong. Lyrics disappeared in lilting seas of music. I was most concerned about the Mandrake song, since it dealt with such a personal part of Margaret's life. But I was rapt when Margaret smiled at the end of it. 'She was exactly like that,' Margaret said, especially in relation to 'Mandrake's' line that the reason she always worked so hard on being a superhero was that she 'couldn't find love'. 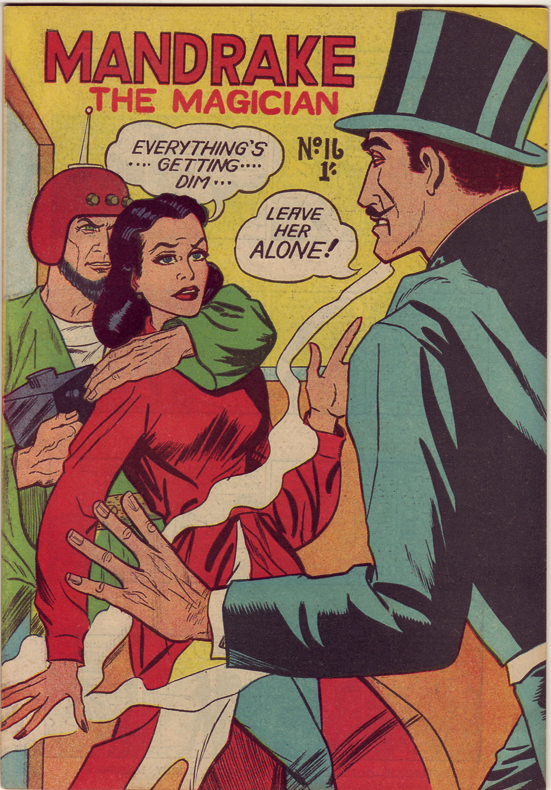 Imagine being cheated on by Mandrake. 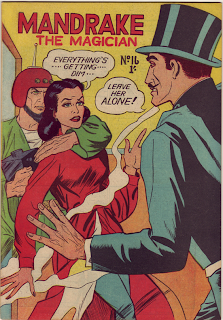 Spiderman you'd understand, but Mandrake? So, Margaret apparently liked the songs and when she decided she could trust me, she let me go ahead with writing the musical. Our cast, gathered in Bryce Ives' kitchen, where many of the rehearsals took place. It's punishingly hard to produce musicals anywhere in the world, let alone in Australia, so I suspected we would have to give it to one of the local theatre companies to present as part of their season. It wasn't a vast production, just a sort of chamber piece with five performers and a small band. Yuri and I shook hands on the production and we took it to Simon Phillips, who was then the artistic director of The Melbourne Theatre Company. At the time they were presenting the musical Urinetown, which both Yuri and I had seen but not enjoyed terribly much. Sadly, Yuri mentioned this to Simon. I've always found that to gain the support of a person of influence, it's often a good idea not to tell them you think their work is crap. But Simon remained very encouraging, and wondered whom I had in mind to play the title character. I'd just been working with Gina Riley on the Kath and Kim series, so I suggested her - good-looking, fantastic comic timing and a magnificent singing voice. Who could be better? This came as a bit of a surprise to Yuri; we hadn't even discussed this, but Simon liked the idea very much and told me to finish it. Some money even changed hands, though I don't recall how much. There was certainly no promise of the MTC taking it on as one of the shows in their latest season, but Simon Phillips' encouragement and money inspired me to write a whole first act, which I sent him. Our cast again. it seems likely that our set will resemble a working kitchen. We have permission to cook stuff during the show. In the last rehearsal I attended, there was much chopping of vegetables and fiddling with pots. It was a little distracting and it will be tidied up for the final production, but I did rather like the fact that at the end of the show, the cast sat and ate what they had made. No food wastage here. Simon was still kind and supportive, but by this stage he had decided he no longer wanted to perform the role of the MTC's artistic director. So, we had a show but nowhere to present it. It gathered dust for a few years. I showed it to Bryce Ives at some stage and gave him a copy of the CD. I remained in contact with Margaret, and made sure that she got invitations to some of the other Sydney shows in which I had played a part. I was glad Margaret came to The Clockwork Forest at the Sydney Theatre Company, because I think that show is the most faithful rendering of my writing. 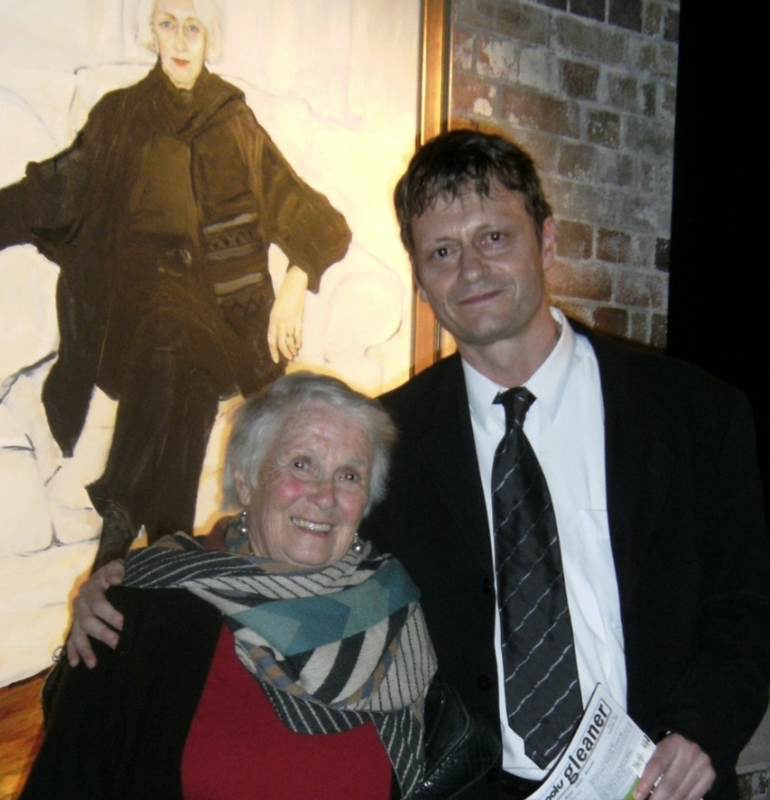 She also saw the Belvoir Street production of Snugglepot and Cuddlepie which I adapted with John Clarke. I remember a ludicrous, plump arts administrator complaining about the script that John and I had written, stating that it was 'little more than a satire on Australian iconography'. This overwhelmed me. If you commission Australia's best known satirist to write a show then complain that it's satirical, it's a bit like buying a cherry ripe then complaining because there appear to be cherries in it. 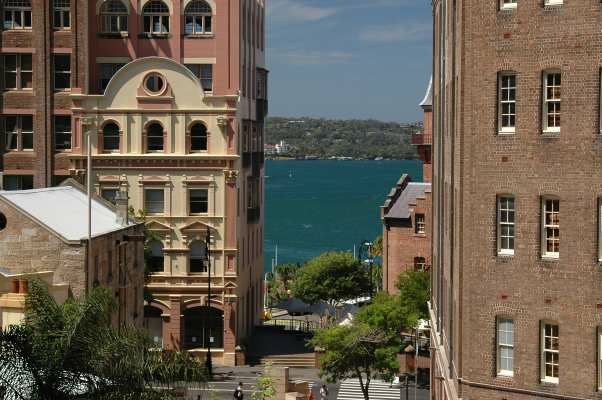 It wasn't a good experience, because of Sydney theatre politics, though I very much enjoyed working with John. 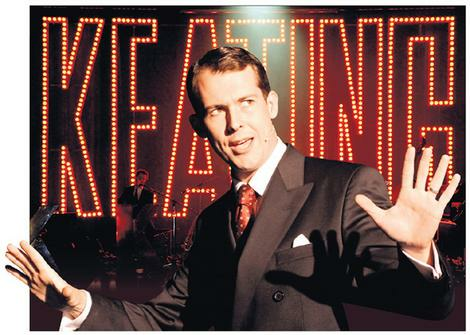 The incomparable Keating, The musical. We were working on the Margaret Fulton show before this mini-masterpiece appeared, and it was an inspiration. Simon Phillips was also in the opening night audience of The Clockwork Forest. I did passingly mention to him that I still had this musical about Margaret Fulton which by an extraordinary coincidence, was holding my hand. I don't know if Simon had lost interest in the project, but he nodded and moved away to chat with a painting. Margaret joined me at the bar. I should have bought Margaret a whiskey and water as I know this is her preferred tipple, but we both downed some white wine while I was eager to hear what Margaret thought of the show. She said that the design was very good - and it was. But, of course, it's not what the writer wants to hear. In the end, Margaret said something polite and kind about the script and I farewelled her as she climbed into a cab and rode back to Balmain. The elegant Brink/STC production of The Clockwork Forest, directed by Chris Drummond. What happened next is I had a stroke. I woke up one morning unable to feel any sensation in my hands, except for a sort of pins and needles feeling in my fingertips. I couldn't talk properly because my mouth drooped down on the left side and I seemed to have developed a slight limp. I journeyed to the local medical centre and they were very adamant that I had to get to a hospital as soon as possible. I really didn't believe I was having a stroke. To me, my voice sounded fairly normal, though I've since been assured that it didn't. I spent a few weeks in hospital, and when I was discharged I looked around for something to do. There was a book I wanted to write, and I've blogged about that elsewhere. I was at a bit of a loose end when Bryce Ives rang, as enthusiastic as ever, saying that he definitely wanted to get the Margaret Fulton musical happening and that there might even be some funding from Port Philip Council and local company Theatreworks. All I had to do was finish it. Director Bryce Ives, very much at home with a microphone. Yuri Worontscak and I signed on, and Yuri patiently helped me with all of the new songs we had to write. (I thought that a quick way of writing songs would be to compose new words to fit already establish melodies, but fortunately Yuri didn't like that idea. 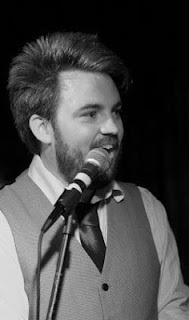 He was very good at doing 'soundalikes' and had gained a reputation for doing the song parodies on shows like Fast Forward and Full Frontal. His work sounded just different enough from the original to keep him out of the law courts. But Yuri was keen to write some brand new stuff, not the old soundalikes. We worked hard on eighteen more songs. (When you've had a stroke, it's a good idea to work with a friend, because the chances are you'll come up with some stupid ideas, and only a really good friend would be brave enough to point out just how abysmally stupid those ideas are.) Bryce kept on at me to finish the script, so he could cast. I decided that whoever played the lead had to be a comic performer, not just a singer, because there were quite a few jokes in the show. 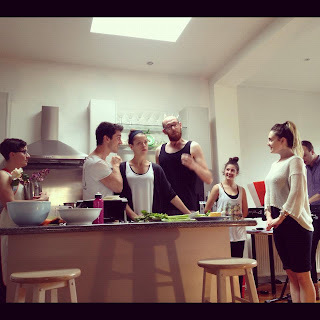 Eventually we had a table reading of the script in the dungeons of the old National Theatre in St Kilda. I recognised a few faces from the old Call Girl prduction - choreographer David Harford and singer comedianne Laura Burzacott. Laura was a perfect fit for the show and did such a good job reading a Rocks character called Bea that I immediately went off and wrote a lot more scenes for her. The amazing Laura Burzacott who will be playing the role of Bea in the show. I don't see how someone so talented can seemingly appear out of nowhere. She hasn't taken a singing lesson in her life, but she has perfect pitch and can give the songs a lot of energy. Though I irritate her when I make the lyrics too wordy. Gina Riley was unavailable to play Margaret Fulton, on the grounds that she'd just made a movie that she was rather keen to promote (I'd worked on the same movie, so I understood.) Wendy Harmer said she was interested, and for a while it looked as though Wendy would be Margaret Fulton, but there was a clash with another big TV gig she was doing. Neither Gina nor Wendy had complained about the pathetically low remuneration we were offering. Maybe they were just being polite? But I think they were genuinely interested in playing such a wonderful cahracter as Margaret. There aren't that many Australian musicals with such a strong female character. Eventually Bryce cast Amy Lehpamer, as he'd just seen her in the retro musical Rock of Ages and she'd been very good. The rest of the cast sort of fell into place. 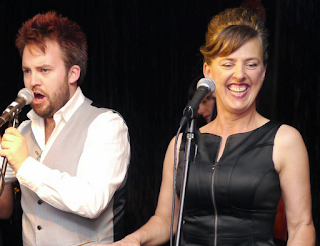 Both Laura and Bryce could make a good living as talent scouts. They seem to know everyone funny and musical and - gasp! - affordable, working on the fringes of Melbourne Theatre. Producer Sean Bryan came on board to help Bryce and organise funding drives. He's young, but has an incredible list of credits from working on shows all over the world. Sean Bryan seeking donations for Margaret Fulton Queen of the Dessert. How could you say no to this face? The script and songs have been through countless rewrites. We manage to cover three decades of Australian history from 1988 on. We sing cautious love songs about pressure cookers and - recently removed - a song that refers to Margaret Fulton's brief flirtation with the communist party in Australia in the fifties. I thought it so surprising the Margaret, who to me represented a fairly comfortable, domestic cosiness should be involved in leftist politics, that I wanted to call the show Margaret Fulton: Communist. But Margaret didn't like that idea at all. She joined the party when she agreed with communism's more noble ideals of nobody being forced into poverty, but Margaret later told me that Stalin had let her down very badly, and that Russia was the one country she was never likely to visit. Yuri came up with the eventual show name Margaret Fulton - Queen of the Dessert. So that's what it's called, for the moment. 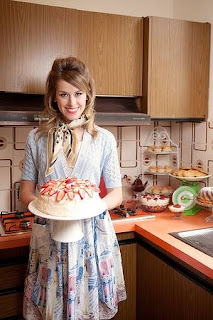 One of the best songs in the show is about jam, which was Margaret's solution to a huge Australian sugar surplus, thanks to some overly generous subsidies from the Menzies Government to cane farmers. This song was also on the original presentation CD. I now want to call the show Margaret Fulton's Jam, since that seems to trip off the tongue nicely. If we do ever get the show to Sydney, I'd hope that the same cast and crew could be involved, since we all worked together to make the idea of the Fulton show a reality. 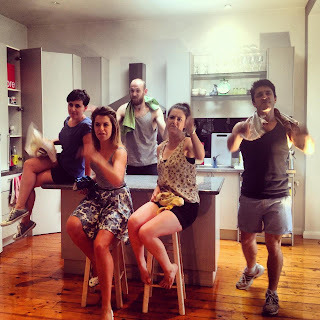 But first we have to get through our premiere season at Theatreworks in St Kilda. Heartfelt thanks to anyone who donated to the project via the Pozible site. See you there!